Dr. Matt Layton never expected to work in addiction medicine. He came to Spokane in 1999, a newly-minted psychiatrist, and started working at Frontier Behavioral Health, which was then called Spokane Mental Health. Many of his patients had drug addictions and serious mental health issues, but the two systems were completely separate: different treatment programs, different funding sources. “You had ‘here’s mental health’ and ‘here’s chemical dependency,’ and they were completely separated, mainly because of the finances,” he said. Early in his practice, he realized that system made no sense. “If they have 60 percent of one and 40 percent of the other, you don’t say, ‘Let’s go fix your 60 percent first and then we’ll deal with your 40 percent.’ That’s what was happening,” he said. Now, Layton works as the medical director for the Spokane Regional Health District’s methadone clinic, treating opioid addictions. 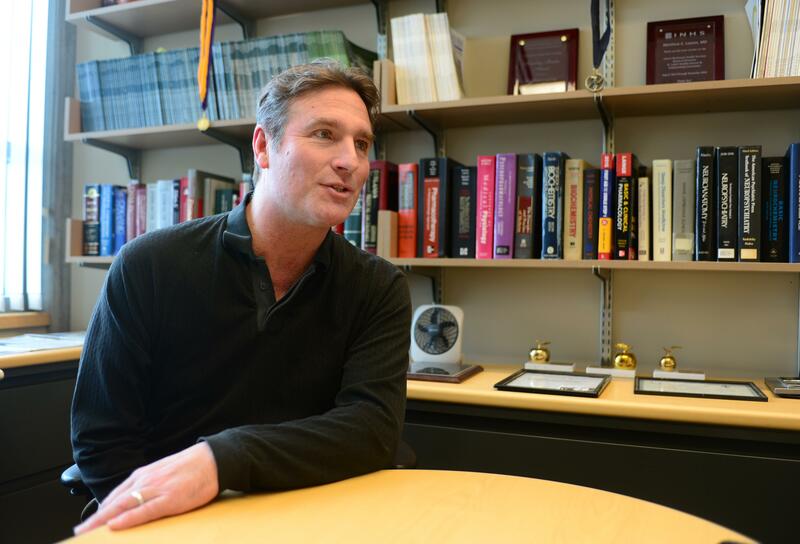 He’s a researcher on addiction and mental health, teaches at the WSU College of Medicine, helps run the psychiatric residency program and serves as chair of the Empire Health Foundation. He’s passionate about better care for drug addicts and people with mental health issues, but he’s rarely agitated or angry. He speaks deliberately and usually wears a big smile on his face. “I’d be a terrible heart surgeon. Standing in one place all day is just not me,” he said. Layton’s colleagues say he was an early adopter of ideas that are just starting to become mainstream in healthcare, like the need for medication-supported and evidence-based treatment for drug addicts, and the importance of integrating mental health into mainstream medical practice. He spent much of 2016 advocating for holistic treatment, more options for drug addicts and better education for medical providers. “Matt is infusing the entire health sciences conversation at Washington State University with awareness of these issues,” said John Roll, WSU Spokane Senior Vice Chancellor at the College of Nursing. This year, he’s often served as the public face of both the methadone clinic and the larger issue of opioid addiction. Julie Albright, the program administrator, said Layton has helped explain what the clinic does and dispel misconceptions about addicts, both in the medical community and to the greater public. “He’s been a huge advocate for us,” she said. Layton brings medical students to the clinic, giving them a chance to see the interplay of mental health, addiction and physical health. He said the people he treats are often seriously ill, with abscesses or heart problems caused by IV drug use. The numbers show it’s people like these who are disproportionately turning up in the emergency room, going to the doctor with withdrawal symptoms or have other complications from their use. Historically, these patients have been viewed as a small, specialty group that most doctors don’t need to worry about caring for. “Not only are they sick, but the mainstream medical community has a hard time accepting them,” he said. Layton believes doctors need to take a holistic approach to treating patients. Primary care doctors should be comfortable recognizing mental illness and addiction and offering patients options during regular office visits. “We have this tendency to react to a physical complaint – headache stomachache, sleep problems – and medicalize it,” he said. Doctors often order tests for outward symptoms instead of spending a few extra minutes listening to their patients. The underlying issue prompting a stomachache may be opioid withdrawal. Stress could cause a serious headache that won’t be resolved with medications. “You’re totally stressed out and you’ve got a kid who’s in juvie and you’re losing your job. You would have a headache, and the approach is not to do a CAT scan. It’s to figure out, OK well, how can we help you with managing your stress,” he said. He received a federal grant to set up protocols allowing residents and doctors at the Spokane Teching Health Clinic to screen for those conditions and offer referrals to care elsewhere. Not everyone is a fan of Layton’s work. He says he still gets pushback, some from colleagues and some from community members, who think of psychiatry as a lesser field of medicine. When he first decided to go into mental health, some people asked him why he was wasting his career. But attitudes are changing. Medical students now are almost always on board with the integrated approach he champions, because many of them grew up in the midst of the opioid epidemic and have seen its effects. Individual patients at the clinic also enjoy working with him, Albright said. “He has such an easygoing demeanor with them that he puts them at ease, so it makes an easy transition for them,” she said. He’s also worked with the Spokane Police Department and teaches officers about mental illness at the department’s crisis intervention training. Thanks to his work, officers in the department’s advanced class have been able to visit the methadone clinic and learn about opioid treatment firsthand from patients. Layton was one of the first doctors in the area to start prescribing suboxone, a replacement opioid used to wean addicts off of more harmful drugs. Roll has worked with Layton to train other providers, especially in rural regions, to prescribe the drug and expand access to treatment options. Earlier this year, he worked with Providence emergency medicine Dr. Darin Neven to start a pilot program prescribing suboxone in the emergency room for people who came in with withdrawal symptoms. “Matt’s one of the big dogs in Spokane that really understands addiction and was really involved in the early part of this opioid epidemic,” Neven said. Because he’s a doctor, Layton is good at explaining the need for treating addiction on multiple fronts, Neven said. Many people still believe addicts need to stop using drugs cold turkey, but users of opioids, which cause chemical changes in the brain, it’s not usually possible without serious side effects. “He is a really good educator on that because he has a PhD in pharmacology. He can actually explain how the neurons and the receptors get used to having the controlled substance,” Neven said. More than 10 years later, Layton still doesn’t consider himself an addiction specialist, though he estimates he spends about half his time working on addiction-related issues. In addition to his work with patients, he also researches addiction and pain medication. Right now, he’s trying to get approval from the Drug Enforcement Administration to look at the effectiveness of marijuana as a treatment for chronic pain. In his work, colleagues say he never stops advocating for the people who need good healthcare the most but are often forgotten. “It’s easy to look the other way, but Matt never looks the other way, and he keeps the rest of us focused as well,” Roll said. Published: Dec. 27, 2016, 5 a.m.